WorshipReady and WorshipTheRock Come Together! Two great worship leader resources now become one. We have a very exciting announcement to make here at WorshipReady.com... and that is the long-standing worship leader forum site WorshipTheRock.com has now become a part of us here at WR! The original founder, Phil Williams, is stepping aside from the great service and community that he has worked so hard to build over the last 8 years and the founder of WorshipReady, Nathan Gifford, has taken over ownership of WorshipTheRock. From the inception of WorshipReady.com, Nathan envisioned much more than the highest quality worship chord charts available anywhere! He wanted to create a place of community for worship leaders to engage together... supporting, encouraging, learning, asking questions, praying for each other, buying/selling gear, etc. This element of WR never really took off, as it's very difficult to get that type of environment off the ground. Also, there were intentions of original worship song submissions with an annual contest for our users. This never took off either as the number of submissions was very minimal. Our starting off as a new company with a smaller number of users initially made it near impossible to launch either of those two features. 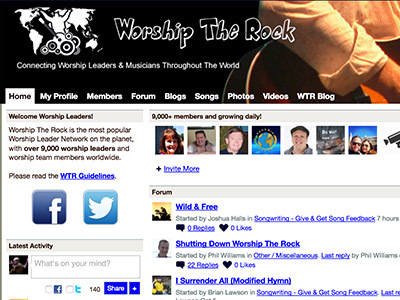 However, WorshipTheRock.com (WTR) has been around since 2008 and has grown into an online community of more than 9000 people, most of which are worship leaders! There is also a large base of users on Facebook and Twitter. In addition, Phil and WTR have run a couple of songwriting contents in recent years. These are two large pieces that have been missing from WorshipReady... but no longer! The free services available to the WTR users will remain... and will always be free! Over time, some changes will come into play in appearance, layout, etc, but the available services will not be lost. The elements like songwriting contests, artist spotlights, album features, etc, which have been sidelined this year, will come back into full swing as well! We will integrate WTR and WR in a manner where it benefits the existing users of both sites and allows us all to move forward together, further developing, learning and equipping for the work all of us do across the globe in music ministry. We want to give a big "THANK YOU!" to Phil Williams for his heart and all of his efforts over these 8 years! He's done a great work and we will strive to build on the great foundation that he has laid, and never let his work fall away or be forgotten. Now, go check out the WTR site, and if you don't have one already, sign up for your free account! I would go to the WTR site which I am already signed up with, but it says that the site owner needs to pay the bill. Yes, we posted on social media about that earlier this week. We have been working on this along with the previous owner, Phil. There is a change that needs made to the account that is taking the company that hosts the WTR site forever to get done. We're dead in the water as we wait. We will move the WTR site to a new setup ASAP that is more dependable than the present environment (as that company is in a mess at the moment), but we have to get back online first. It's frustrating but we're knocking on that door constantly! Stay tuned! All the best for your continued success. WTR and WR is a great partnership. Phil started a great community and I promoted it to a lot of local leaders. I look forward to seeing increased participation as a result of the partnership. Was glad to see WTR back up and going. Just joined here from the ad on WTR. Question: Why are there no Messianic denominations listed on the profile page? Welcome Dave! Please provide the denominations that you find as missing or a reference link to them and we'll get that corrected. Certainly they are not missed intentionally. Thanks for pointing it out! We Messianics have a lot of unique worship music. Some of it has gone mainstream via Paul Wilbur and Joel Chernoff. Those options have been added to the profile setup. Thanks for your input! BTW - how much in the way of Messianic lead sheets/chord sheets do you have? Well, we do not sort our charts in that manner. There isn't much in the way of Paul Wilbur, but all of the songs are tied to Jesus our Messiah. :) If there are songs you want charted that we don't have, just click the button on the left of the site to request a chart. What we add is driven a lot by what our subscribers are requesting. Finally ! I usually find 1 out of 5 of the popular songs we do each week. This was the first week I found them all ! It's nice to just download a tune in OnSong format. So I've created a bunch of songs for use in OnSong. Is there a way to upload songs that aren't in the library and earn credits? Hello! Glad you found all of your songs this week! :) If there are songs you need that are not already available, use our chart request feature. Much of what we have is driven by these chart requests. We are constantly adding new songs, but you can steer that a bit with the requests. Regarding uploading charts, no, we do not have a setup for that and never intend to. People use WorshipReady because the charts are professionally created and guaranteed accurate. There are other places to get charts made by random people. No offense intended at all... and your charts might be great... but we only use charts that we created. We don't even use charts provided straight from the publishers. Why? Because they are rarely correct. Usually close, but not quite. We strive to maintain a level above everything that is available... and of course, in OnSong format for you. Thanks! I think the answer is going to be 'no', but is it possible to transpose a chord chart before downloading it in PDF or OnSong format? I know I can change the key in the OnSong display, but it's so much easier to make alterations to a song when the base chart is in a key I want. You can not generate a PDF chart in another key yourself, no. However, many songs already have PDF charts in other keys. If they do, they're in the center area as a text link under a heading of same chart, different keys. If you do need a PDF in another key, simply use the chart request button and check the box saying you need the alternate key. We'll get that done and made available to you quickly. Now as you said, you can change the key anytime in OnSong. So if that's what you're using, there is simply no need to request an OnSong chart in another key. If you want to change the chart to a new default key, you can do that yourself. Go to the edit view and you can have it rewrite the chart in your desired key.